Glaucoma is not one disease, but a group of diseases which have in common that they cause damage to nerves carrying messages from the light sensitive cells of the retina to the brain at the point where they exit the eyeball, at the optic nerve. It is helpful to separate the condition into either open-angle or closed-angle, depending on the access to the internal drain of the eye, because they are treated differently. Glaucoma is the most common cause of preventable blindness in the UK. This does not need to be the case because in the overwhelming majority of people who have this disease the loss of sight can be slowed with treatment to an extent that it will never have a significant impact on their life. It is a great tragedy that many people are continuing to go blind unnecessarily because they do not know they have glaucoma. In the UK about 1 in 50 people older than 40 years have open-angle glaucoma, and this figure rises to about 1 in 10 in people older than 75 years. Closed-angle glaucoma is less common and affects about 1 in 1,000 people; it is more likely as you get older, and in long-sighted people and in women because they tend to have smaller eyes. There is a fluid inside your eye called aqueous humour, distinct from the tears that wet the surface of your eye. This fluid is produced within the eye and passes through your pupil to drain away through a sieve-like area called the trabecular meshwork that encircles the eye within an angle formed by the cornea and the base of your iris. There is usually a constant production and drainage of aqueous humour fluid, which maintains a normal eye pressure. In glaucoma the main cause of damage is that the pressure of the aqueous fluid in the eye becomes too high. Not everyone with high eye pressure has glaucoma, but these individuals with ocular hypertension do have a relatively high chance of developing glaucoma later in life. Conversely, some people with an eye pressure in the normal range develop glaucoma. It is felt that in that in these individuals the optic nerve may be particularly vulnerable to damage due a poor blood supply or other factors. If one of your close relatives (mother, father, sister or brother) has glaucoma you have an increased risk of developing the disease. However, the inheritance is not straight-forward and not everyone with a family history of glaucoma will develop the condition. Conversely, some people develop glaucoma when there is no family history of the disease. The level of pressure within the eye is dependent on the balance of aqueous production and drainage. A high eye pressure is almost exclusively caused by poor drainage. In the most common form of glaucoma the access to the trabecular meshwork remains good but its permeability is reduced, either through age-related changes or clogging with pigment or other particulate matter in certain conditions. In these cases the eye pressure is modestly elevated and the loss of vision is typically slow, occurring over several years. In this less common form of glaucoma the aqueous fluid is not able to pass between the iris and the crystalline lens, and so pressure build up behind the iris that pushes it forward over the trabecular meshwork. This typically leads to a rapid rise in eye pressure that may lead to blindness within hours. Some people are more prone to develop angle-closure because their eyes are smaller and so its contents are more crowded, which causes the iris to rest more heavily on the crystalline lens. Nerve fibres originating from the outer parts of the retina are damaged first in glaucoma and so the disease is characterized by a progressive loss of peripheral vision. Without treatment this tunnel-vision extends centrally. In open-angle glaucoma there is no pain and the loss of vision is gradual so that without regular eye examinations people only become aware of a problem when they have lost almost all of their sight. In angle-closure glaucoma there may be no symptoms other than progressive loss of vision, but more usually the condition is sudden and accompanied by severe pain within or around the eye, marked redness of the eye, blurred vision with haloes (circles) seen around lights. The mainstay of glaucoma diagnosis is based on viewing the optic nerve, assessing peripheral vision and measuring the eye pressure. We are part of an referral refinement scheme for glaucoma that is run in East Lancashire. This means that any patient showing suspicions signs of glaucoma will have their visual fields and pressures repeated on different days and by different methods. 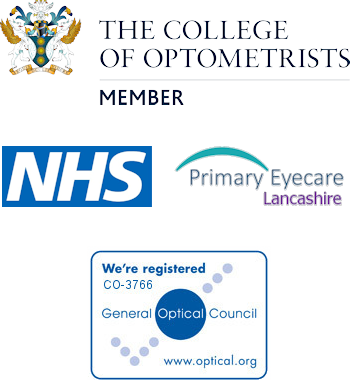 Also other opticians and GP’s that refer to the hospital, not having performed these additional tests, will be sent to accredited opticians, such as ourselves, to have their referrals refined. This is part of our IOP / VF referral refinement enhance service. The treatment of glaucoma aims to lower eye pressure and stabilize the disease. It is not possible to restore lost sight and so early detection is vital. Treatment for open-angle glaucoma is usually as straightforward as eyedrops used every day. A small number of people with glaucoma require more aggressive methods to lower eye pressure and do better with surgery. Quick treatment is needed for angle-closure glaucoma. The first treatment is medication to lower the pressure within your eye using eyedrops, and when the pressure is exceptionally high using tablets or an injection. When the eye pressure has reduced, further treatment is needed to prevent the condition from reoccurring. This involves using laser treatment to make a small hole in your iris to relieve the pressure behind it, a procedure known as a laser iridotomy. Sometimes eye drops are needed as long-term treatment to help keep your eye pressure under control.